When Sicario was released in 2015 it was perceived as many things. It was easily one of the best movies of the year and was likely robbed of some Oscar love. It also cemented Denis Villeneuve is one of the best directors working today and it proved to be a bold, unflinching look at the war on drugs. What it did not seem to be was the beginning of a franchise. Yet, Sicario 2: Day of the Soldado, against the odds, showcases that this is indeed something that deserved to be turned into a franchise. It's an unlikely sequel that has justified its existence by simply being excellent. Sicario 2 centers on FBI agent Matt Graver (Josh Brolin) who calls on mysterious operative Alejandro Gillick (Benicio Del Toro) when Mexican drug cartels start to smuggle terrorists across the U.S. border. The government is trying to literally start a war with the drug cartels and is venturing into some risky territory in order to do so. The war escalates when Alejandro kidnaps a top kingpin's daughter (Isabela Moner) to deliberately increase the tensions. When the young girl is seen as collateral damage, the two men will determine her fate and end up on opposing sides of a dangerously complex and violent situation. Sicario is a movie that felt special and singular. It had a beginning, middle and end and did not feel as though it warranted a continuation. But the war on drugs is a complex beast and the world that these characters inhabit is vast. Despite everything that could have worked against something like this, which couldn't even be written off as a cash grab since Sicario didn't do all that well at the box office, this movie totally works. In some ways it doesn't feel quite as special as the first movie, but that doesn't take anything away from the fact that this thing is intense, heavily ratchets up the action, doesn't have any drag to it and manages to stand on its own while feeling totally connected to what came before it. Few sequels, especially ones that feel as initially unnecessary, fell as satisfying in such a way. 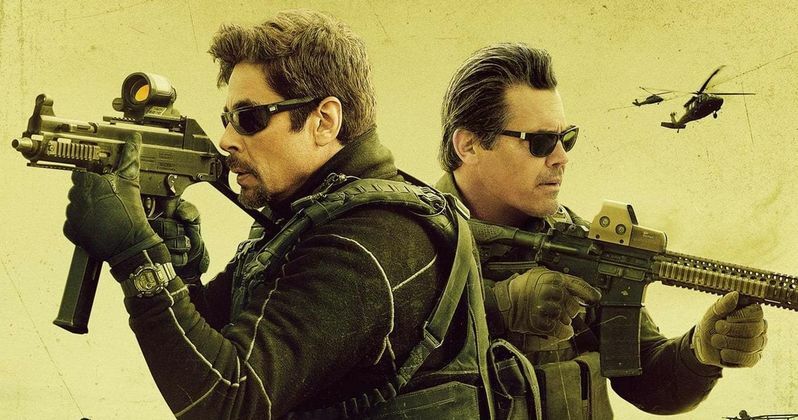 Even though Emily Blunt doesn't return this time around, the duo of Josh Brolin and Benicio Del Toro anchors Day of the Soldado to its predecessor. What's perhaps most satisfying about this movie is that it dives far deeper into both of these characters, who were both supporting players in what was Blunt's story the first time around. Despite all of the flashy action, which is welcome and incredibly well executed, this really turns out to be a rich character piece. This movie really manages to surprise in many ways. Perhaps that has to do with the low expectations one might bring into it. Whatever the case, the creative team really pulled something pretty great together here. Denis Villeneuve didn't return to direct and while the sequel doesn't quite have his same style, it would be hard to say the movie suffers as a result. Much of that likely has to do with writer Taylor Sheridan, who penned the original and has proven himself to be a master of his craft in recent years. He's the consistent cog that has helped turn Sicario into a franchise. I also don't want to take anything away from Stefano Sollima here. The dude had some massive shoes to fill and he stepped up in a big way. You're going to leave the theater wanting to see the next thing he does, no doubt about it. The drug war is an ugly thing and, much like its predecessor, this movie pulls precisely no punches and is willing to show just how ugly and violent this world can be at every turn. That ugliness, ever present, doesn't make this movie an arduous undertaking for the viewer though, which is perhaps its greatest strength. Without compromise, Sheridan and Sollima, with Sony wisely backing them, have crafted a movie that feels authentic to the real-world events it is trying to channel while also making a blistering and entertaining movie through and through. Not only that, but without feeling overly shoehorned, they've also set up at least one more movie, which feels like something I definitely want to see. Two years ago, I rolled my eyes at the idea of Sicario 2. Now I'm eating crow as I eagerly await the next entry. Well played, Hollywood.